Can we Separate Governance from Management? Governance and management of enterprise IT comprise of different types of activities, with different responsibilities. Given that the role of governance is to evaluate, direct and monitor, a set of interactions is required between the two to result in an efficient and effective governance system. COBIT 5 advocates that enterprises implement governance and management processes such that both governance and management areas are covered. These two areas contain total of 5 domains and 37 processes. 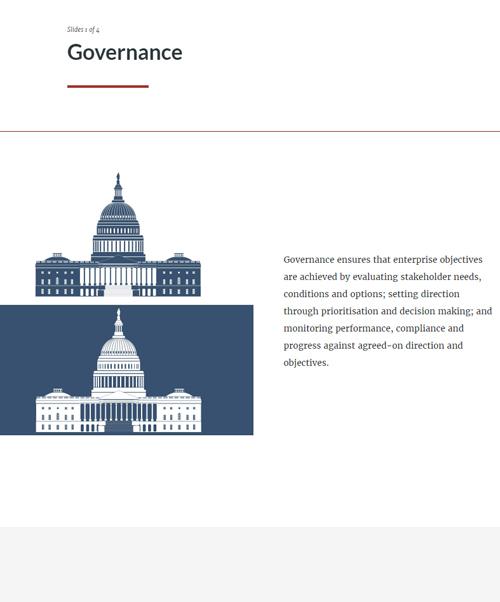 In this interactive COBIT 5 learning resource we look at the question of whether you can separate governance from management in COBIT 5. If this COBIT 5 resource interests you, why not view our other COBIT 5 learning resources? Or view our full library of downloads covering a wide range of subjects and domains!